Inspire young children with this delightful series of board books based on well-known Bible characters. Using a simple word-per-page storytelling technique, these are ideal for beginning readers, and for grown-ups who love to fill in the gaps! Ages 2-5. 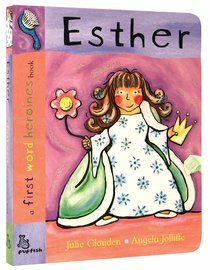 About "Esther (First Word Heroes Series)"
Based on well-known Bible character, Esther, these book is glittery, gorgeous and Esther, a good role model for those little princesses. These hard board Books to can be read together or alone and each picture is accompanied with one key word to learn, with the extended story at the end. They have glitter varnished heroine covers for extra dazzle!